I "finished" the new edit on Monday. This has been a huge effort and glad things are still moving along. Here is a screenshot. It is fully functional at this point. The biggest difference is that all card elements are on this one window. 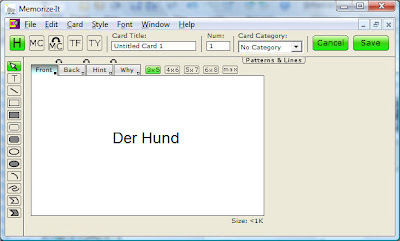 To change the title, card number and category you used to have to click a button to open a dialog which slowed the card creation process. I've also made the card styles and tabs single click "buttons" instead of pull downs in the previous version. This will cut down from two click to change card style or card side to one click speeding the card creation and editing process. I've also added fixed sizes for the cards (3x5,4x6,5x7,6x8) as well as the Max setting which maximizes the card size for the edit window. The previous version always maximized for the window size. This caused problems when people maximized to full screen the cards were just too large. At least now the card size can be easily set to a specific size. One concern I have is that 3x5 is in inches which is very American. If you know how the metric world sizes index cards please contact me, I could use the help. My friends don't link the green buttons so I'm probably going to go back and rework the button colors, but that is just are and doesn't change the functional working of the window. Now I'm back to working on the standalone quizzer and will finish that and come back to working on Memorize-It 5.